Depending on your definition of "seasoned superhero," that phrase could either mean an accomplished pro, "tired and weary," or some combination of both. 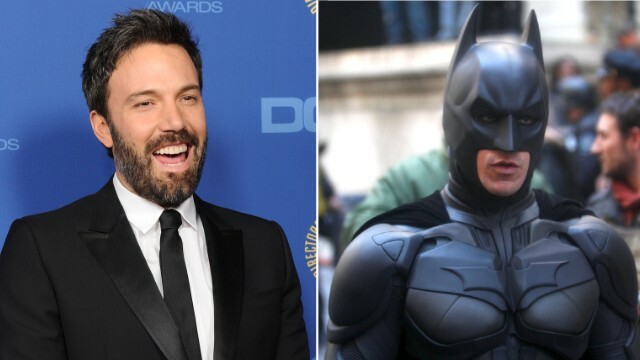 It sounds like Warner Bros. is applying the latter to its description of Ben Affleck's Batman, who will appear in 2015's Batman vs. Superman movie. According to industry paper Variety, Warner Bros. CEO Kevin Tsujihara told investors at a Thursday meeting that Affleck's take on the caped crusader will be "tired and weary and seasoned, (having been) doing it for awhile." While that might not inspire a lot of confidence in fans who've criticized the studio's choice to put Affleck in the role, Tsujihara is taking the intense and heated reaction - there was even a petition involved - as a good thing. The follow-up to this summer's "Man of Steel," which will again star Henry Cavill as Superman, Amy Adams as Lois Lane, Laurence Fishburne as Perry White and Diane Lane as Martha Kent, is scheduled to bow on July 17, 2015. With Affleck in the role Batman has officially jumped the shark. We will not be wasting money on those tickets. I still think in a fight batman would beat superman. Superman has strength and speed, but batman has a lot of agility and martial arts. The only way batman could possibly win is if he had kryptonite. Supes is unfathomably better at everything physical than batman, excluding specific fighting styles, which would be inneffective against the demi-god that is Superman. They already did fight in "Batman: The Dark Knight Returns Part 2"
Superman would beat Batman without getting near him! All he'd have to do is throw one sonic punch from far enough away to be safe from Kryptonite and the fight would be OVER! I,too, am tired of Ben Affleck. all comments from last night have been filed. I can't believe this is who they cast as the next fellow to wear the batsuit – where are all the other actors available for the role ? Answer me that, casting directors ! There is still time to cast a new actor before shooting starts, it does happen. Remember Back to the Future where Eric Stoltz got replaced by Michael J. Fox early in shooting the movie ? Take a deep breath, drama queen. It's only a movie and it's only a kiddie's super hero. Why don't you remove that stick from your behind, John? There's no need to huff and puff and get annoyed because people have different opinions to you. Very rude. I'm glad he will be playing it. Maybe he will give new life to a character that keeps being played by the same character time after time. I would rather have seen Mister Bean in the role rather than Affleck. Agreed. Bean as Batman would at least be intentionally funny, as opposed to the other kind of funny. Me. Bean, forgot about him. Lol! It looks like WB is already in damage control mode covering for Affleck's acting. No doubt impressive the super hero films are when you first see them they do not have any staying power. Other classic films get better with repeated viewings but I find the hero films and all their CGI become very tired after watching them more than once. Hollywood is going overkill with all these reboots of rebooted films!! Oh no it's Batman after RIP and right before Final Crisis! Eric Bana would of played it ten times better as he has proven he could play a dark character in start trek. You can't even wait to see his performance before judging it? There you go. I was trying to think of some better actors, and Bana would have been a great choice. Maybe his previous role as Bruce Banner ruled him out, but I don't think fans would have cared about that. Batman has been played by some bad choices before (Clooney, wth) so I'm not AS surprised or annoyed annoyed by this as I was when they announced that the character Jack Reacher of the Lee Child novel series would be played by Tom Cruise. I actually almost dry-heaved when I heard that. OK, not really, but I was disgusted. Reacher is described in the books as six foot five inches tall and massively muscular, with light hair and blue eyes. And they cast pipsqueak Cruise? Cruise can be a great action guy but it was a case of them choosing the actor based on presumed box office draw rather than the fit for the character. This Batman choice was the same kind of nonsense. "Would of"? I'll bet that Affleck can at least write on a level higher than an 8-year-old. Yeah, Cruise can be a great action guy if all the other actors cast are 4'11. He is a tiny little cry baby "dont talk about my religion or ill sue you waaah". I think his acting is actually getting worse with each film, that Oblivion or whatever from last year was SHEEETEEEY!! Nobody could be worse then George Clooney as Batman. Nobody. Clooney killed the franchise. Where were the fan boys then? Ben is not going to be the focus of the movie. He has done a good job in pictures where he does not have to do all the heavy lifting(acting wise) We will see. You don't really get that the movie (concept, writing, direction, production design, etc.) was terrible, not George Clooney's performance. He was merely along for the train wreck of a ride. I guess that means Affleck will be the only actor to play both Superman AND Batman. Can anyone say Daredevil? I will not be seeing this movie until it comes out on HBO. And I may not watch it even then. Affleck has already ruined one superhero movie. Why waste so much money having him mess another one up? That'll show 'em, Joe. You stay at home; meanwhile, millions of other curious folks will watch it. This sounds worse and worse. Ok, whenever I hear about a new movie and I hear that Affleck is in it, I say to myself ... "That's too bad I would have liked to see that one!" Not sure that the whining is about regarding Affleck playing Batman. After all, this is a sequel to this summer's Superman movie. It is not another Batman flick, nor is it a Justice League film. It is Batman making a cameo in a Superman movie. The should have chosen Dwight Schrute instead of Ben Affleck. Why did he start directing? Because he SUCKED at acting and people wouldnt go to his movies. Gigli? Hollywoodland?Because people equate him talking as fingernails on a chalkboard, chewing on tinfoil, forcing us to pay money for a movie knowing that he will devalue the final product! So he's tired. So are we, of him. Next. I am coincidentally tired of Ben Affleck. So tired and weary is French for lame? Would love to reserve but the fear of a reboot of Joel Shumacher's batman is making me wary of this casting choice. Should of gone with a un-established actor. What next Matt Damon as robin? "should of?" is proper English dead? and here comes the grammar police!! After watching Argo, Hades has official frozen over for me. He wasn't bad. And if he wasn't bad in THAT movie then maybe he won't be bad in this one. I mean, all you need is someone who can scowl and keep a straight face anyway. As long as this Batman isn't too angst-y maybe Ben will be fine. CNN's headline writer is going to need to learn to spell.